This application is designed for Visual DataFlex 16 and uses the libraries for DAE's Graphical Library (version 2.2). Thus you will need to have these installed. 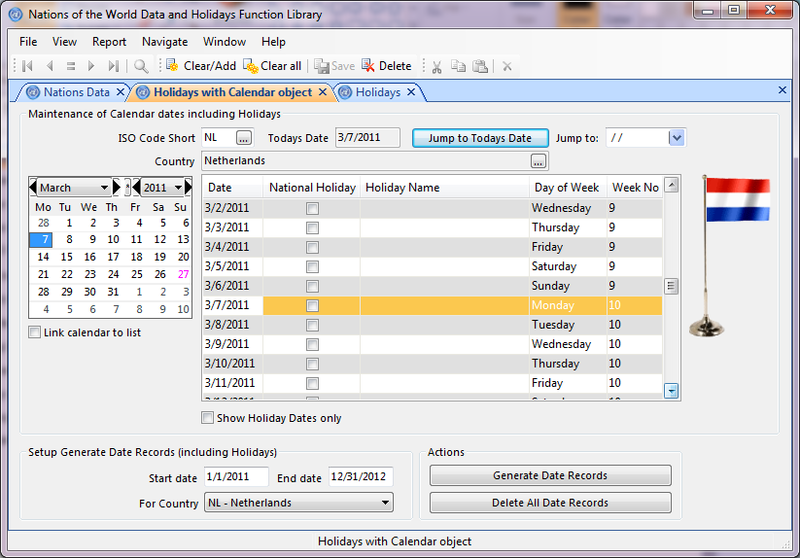 The function library CalendarHoliday.pkg contains about 50 functions for different holidays. You pass an integer variable with the year and the function(s) will return the date for the holiday. For some of the functions you also need to pass a nation code. 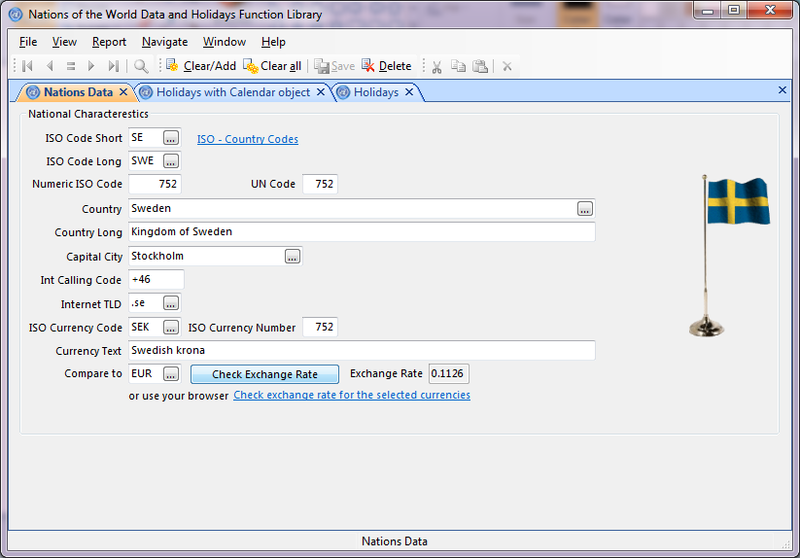 At an aggregated level you have AmericanHolidays.pkg, SwedishHolidays.pkg and some other languages (see list below) - that is used in the sample National Holidays program to create database records for all dates for a given date interval for those countries. However, you don't need to use the function pack as in the sample application - it is just a demonstration of the functions. You could also use these functions ad hoc in your code. It also contains an AutoReindex function logic that will automatically sense if your df_collate.cfg is different then what the database uses - and if not automatically reindex all tables prior starting the program. This is a generalized solution that might be usefull for you in other programs. The Nation's Data view shows the general data that is stored per country. 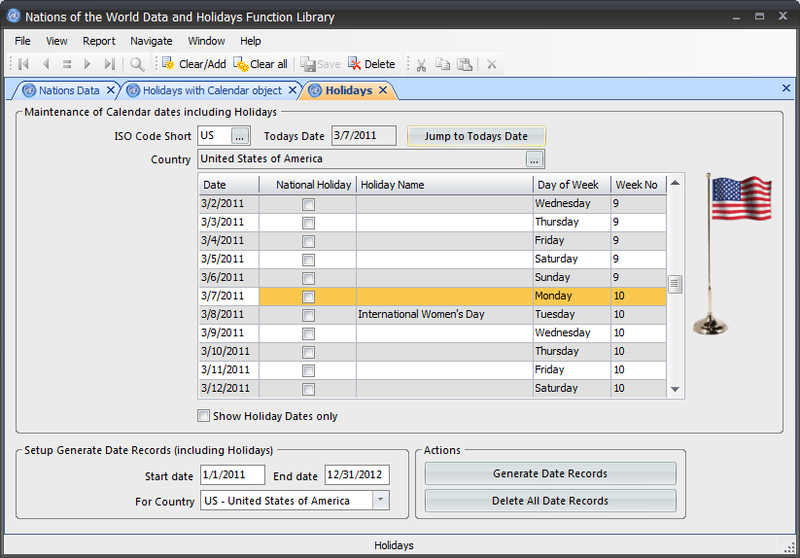 Here you get a connection with calendar control - made by Peter Crook in Visual DataFlex code - and a library oversight of the date with holidays. and -while having applied another skin using the skin selector also available in this project- the holidays view without the calendar object from Peter Crook. More nations can be supported! We need your help as a developer to develop national holiday packages for those country that are missing from the list above - it's really easy - just follow the provided examples. Please contact me via the forum thread below and I will assist you further if necessary!